Another beautiful scarf/wrap woven by Katie. Love the stripes and colour combination. 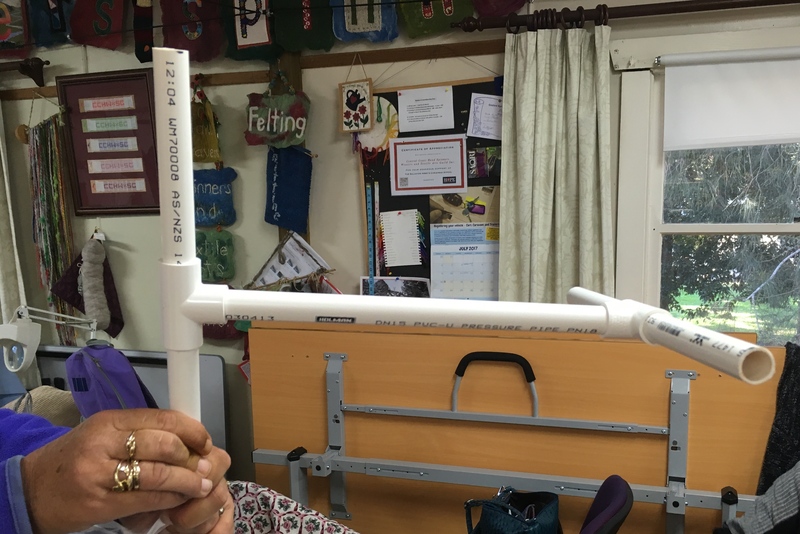 Bel made this very nifty niddy-noddy out of pieces of plastic pipe and a couple of connectors that she bought from Bunnings. What a clever idea, and once you have your yarn wound on, you can dye it while it is still on there. Ingenious. 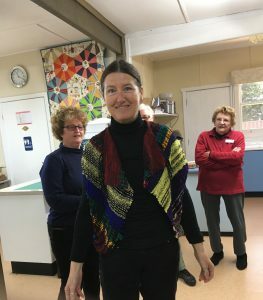 Lyn brought in a few of her clothing pieces that she had put together for a few events that we would be attending. 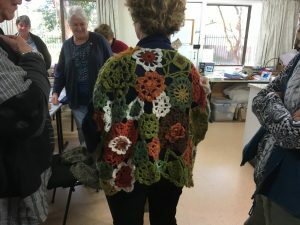 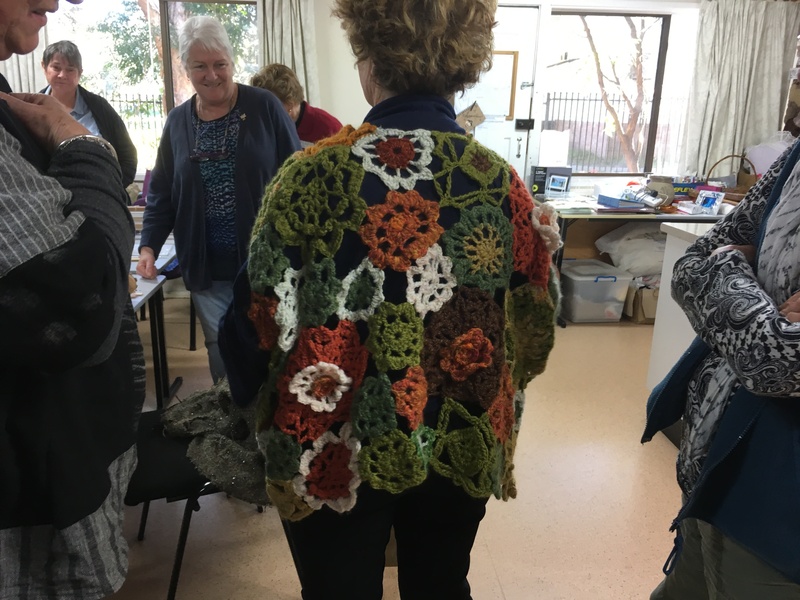 This is such an amazing crocheted jacket. 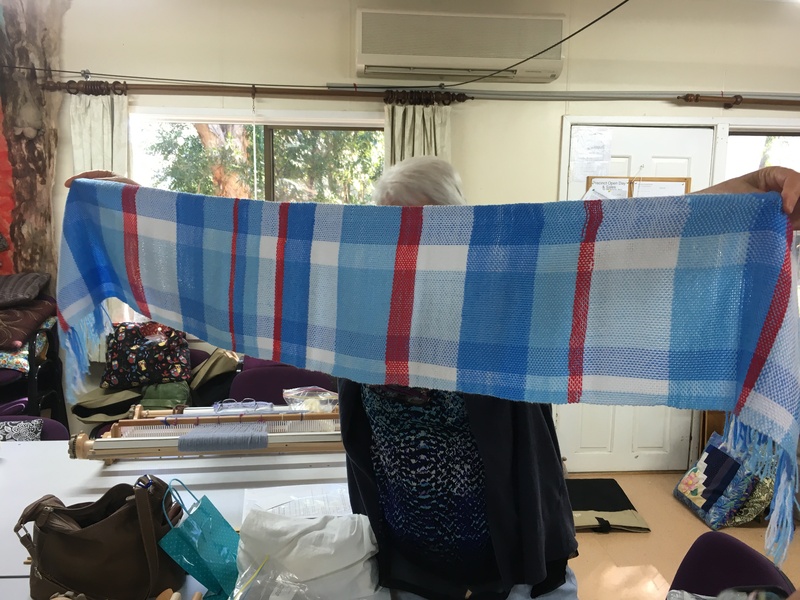 Next she modelled one of her lovely ponchos woven on the Saori loom. 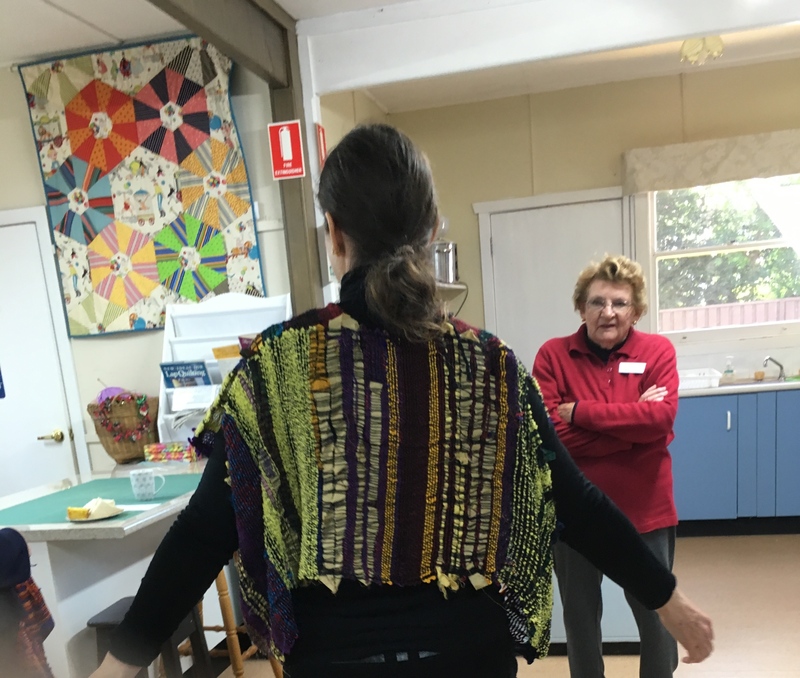 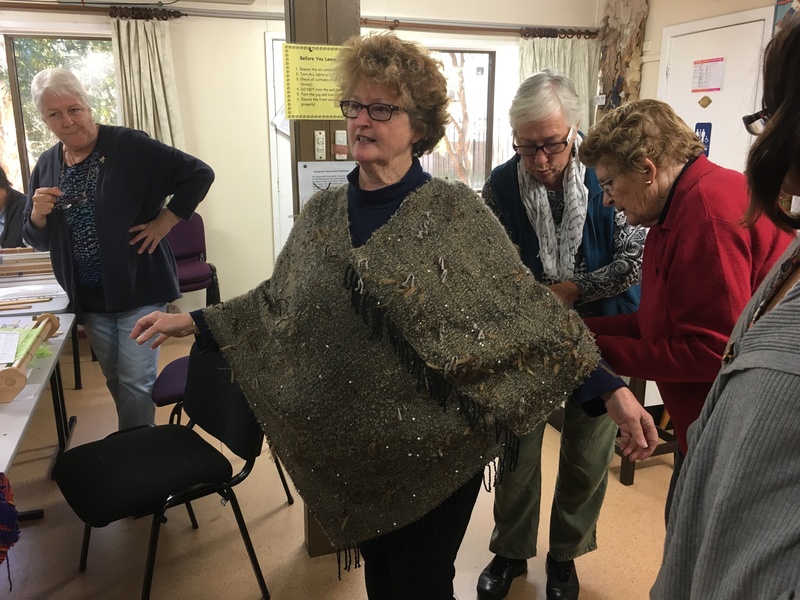 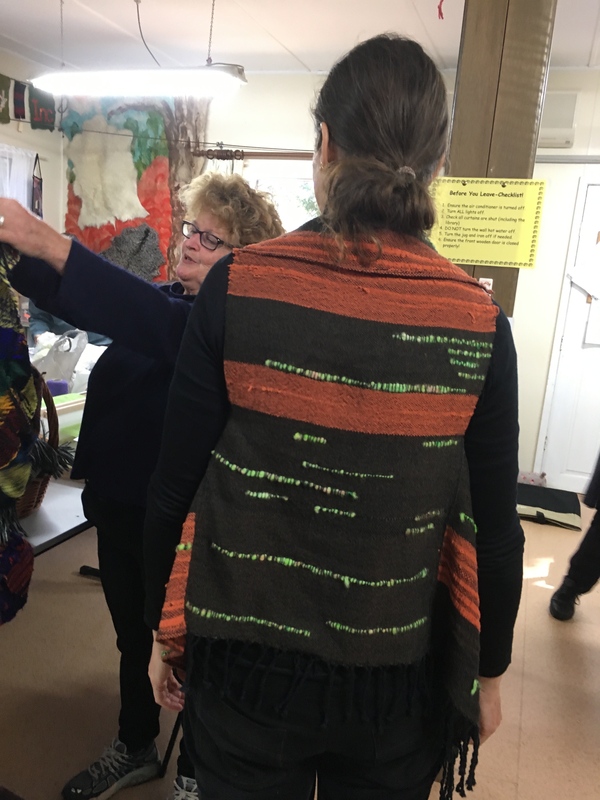 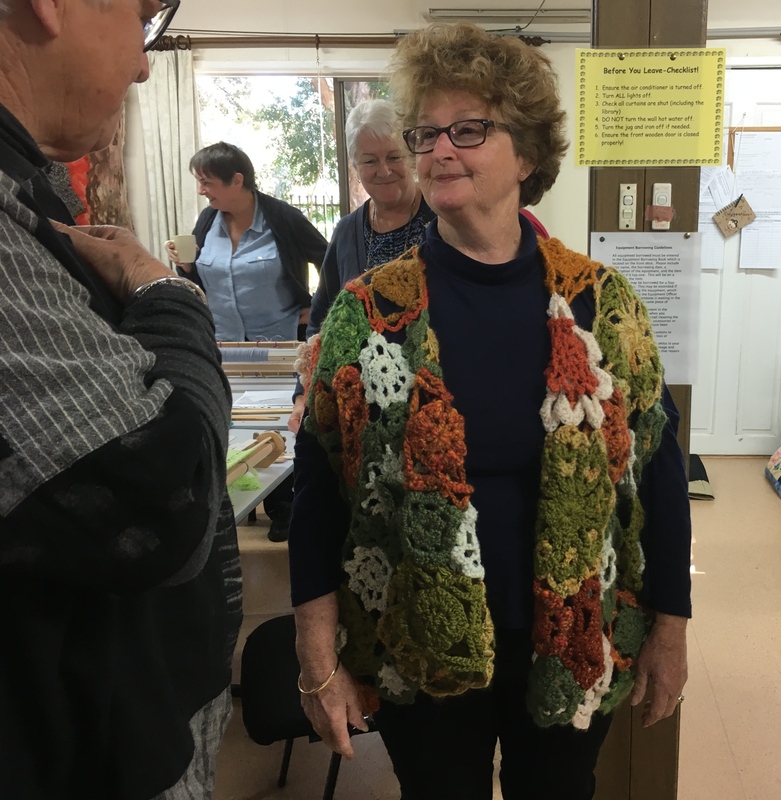 Naomi modelled a couple of Lyn’s sleeveless jackets that she made using Saori woven scarves and wraps. 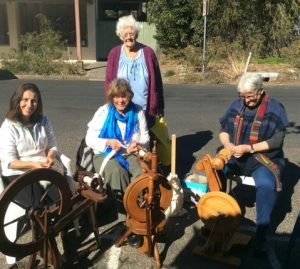 Trudie, Donna and Denise were having a lovely time spinning outside the Patonga Bakehouse Art Gallery during Trudie’s exhibition. 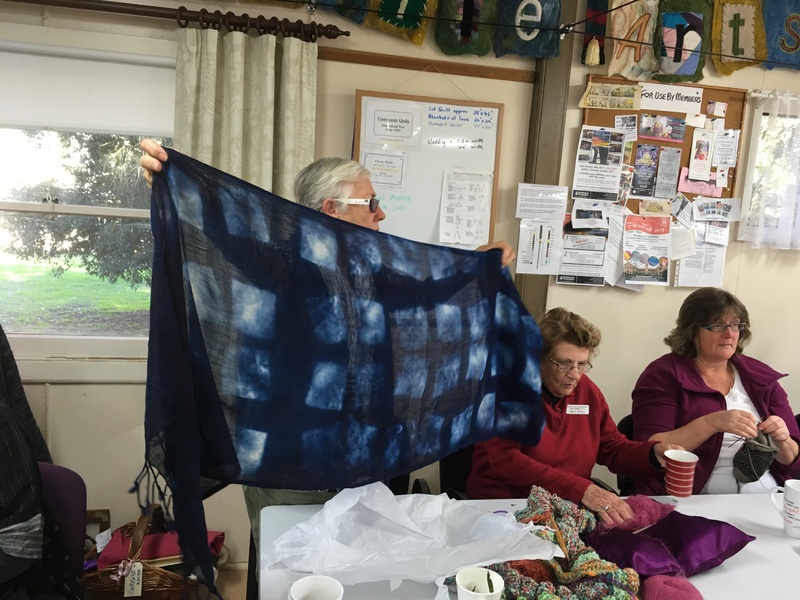 There were beautiful Shibori indigo dyed scarves and shawls in silk, wool and cotton. The exhibition was a great success. 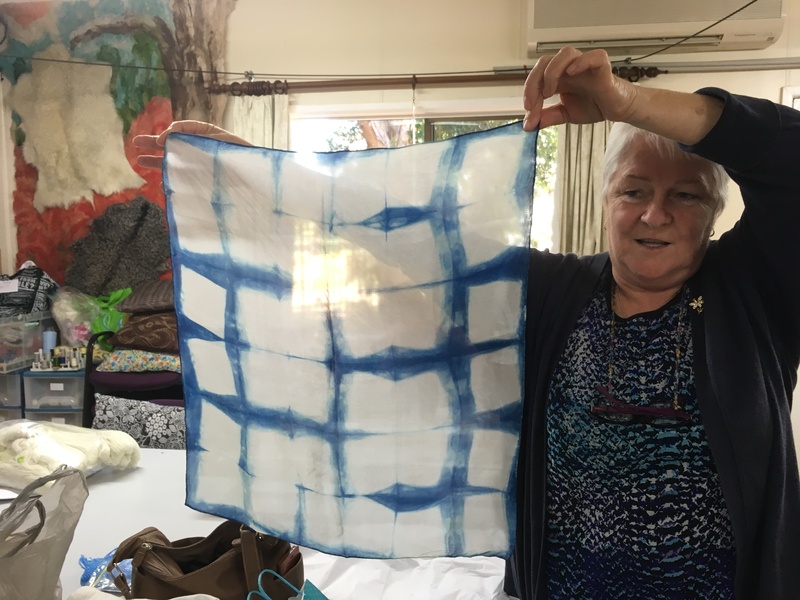 Katie came home with a lovely silk scarf, and a shawl for Lyn too. 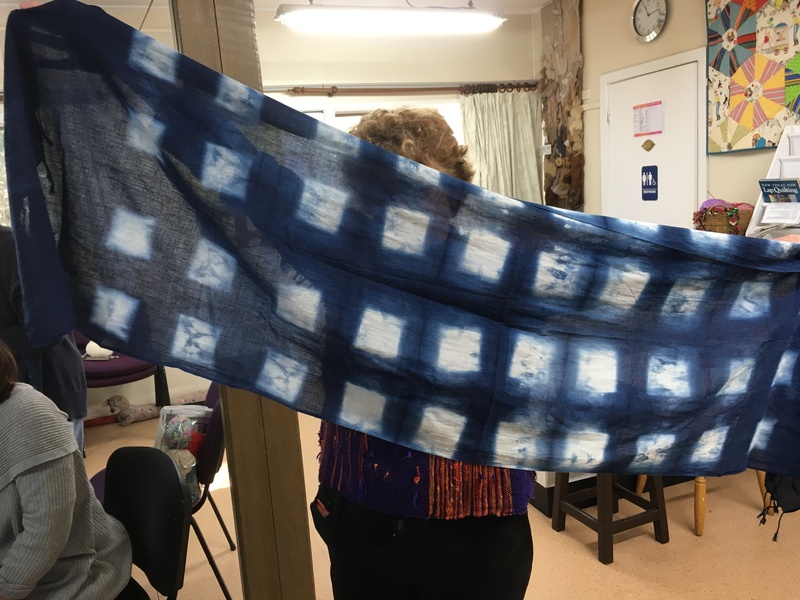 Deb has been getting out the dyes again, this time creating some lovely blues and purples. The fleece is now carded ready for spinning. If you love knitting socks, then this is the knitting needle for you. 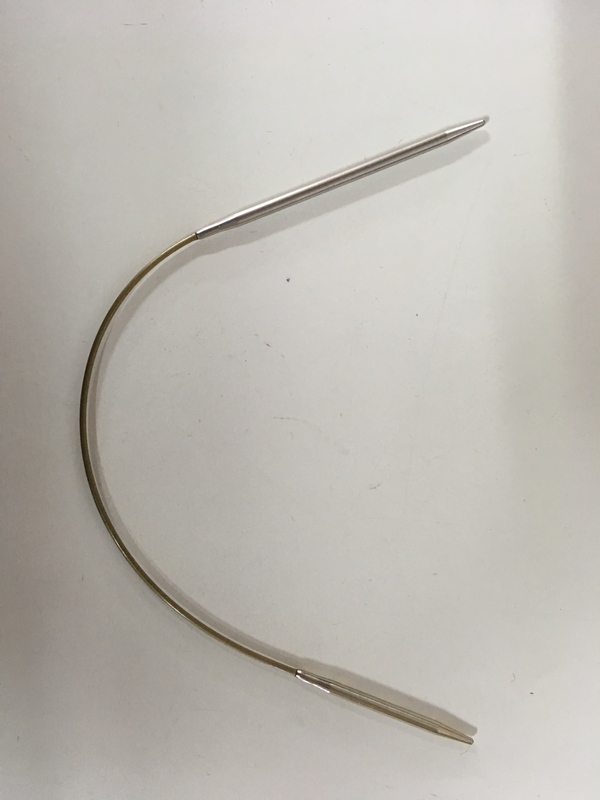 Bel brought this tiniest of circular needle to show us the other day, which is for knitting socks. 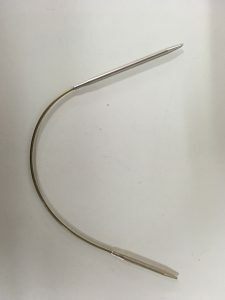 Apparently you still need to use double pointed needles for the heels, but this needle is perfect for the rest. 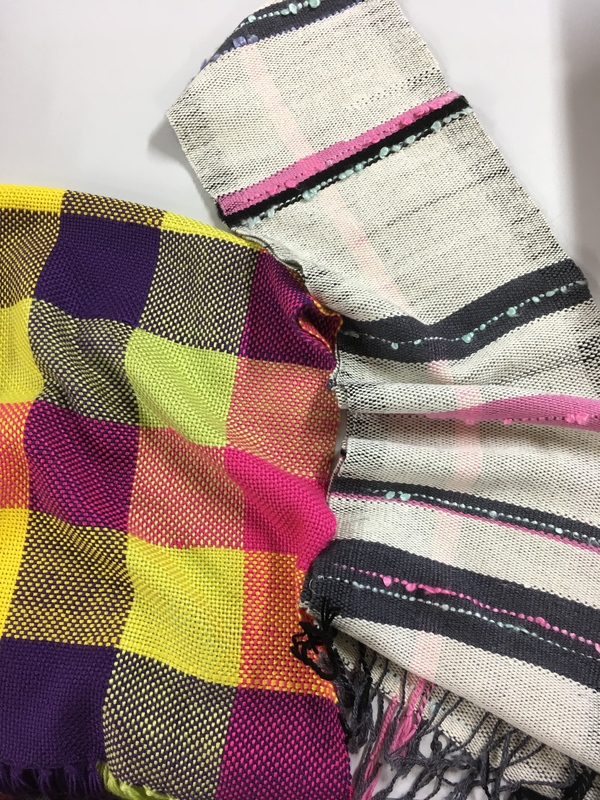 Katie wove these two colourful scarves. 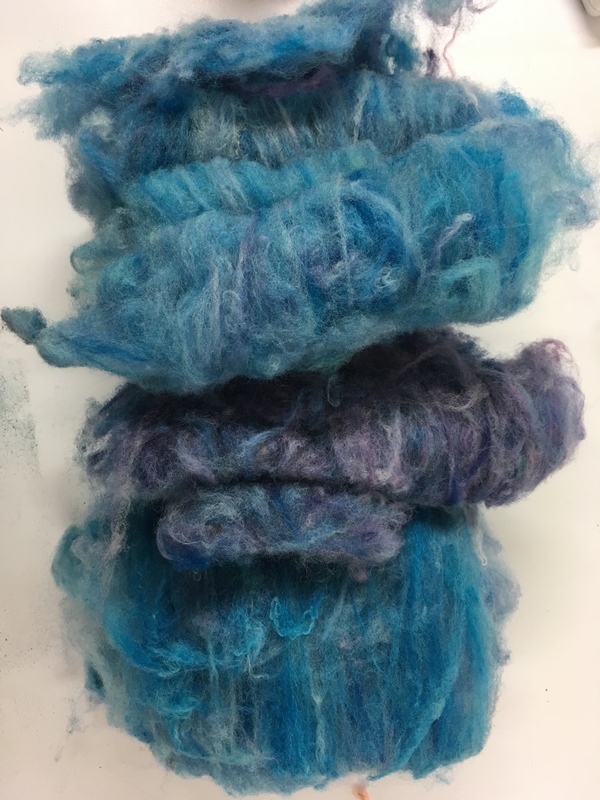 The one on the left was an experiment with colour which has turned out amazingly. 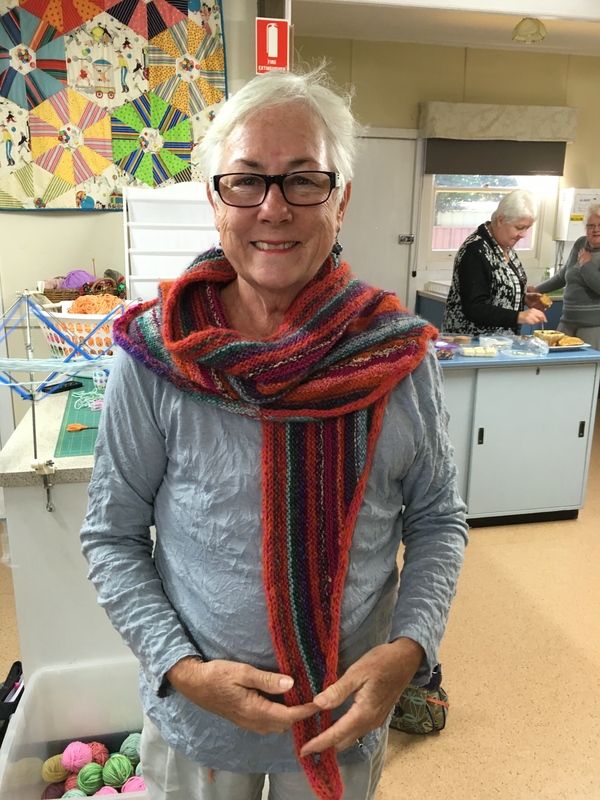 Jenni has knitted this beautiful, colourful scarf, and I love the i-cord edge. 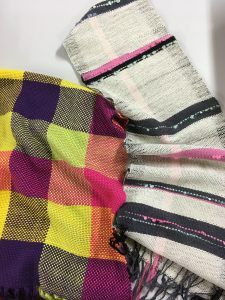 It looks so neat and gives the scarf more texture which I think looks fantastic. 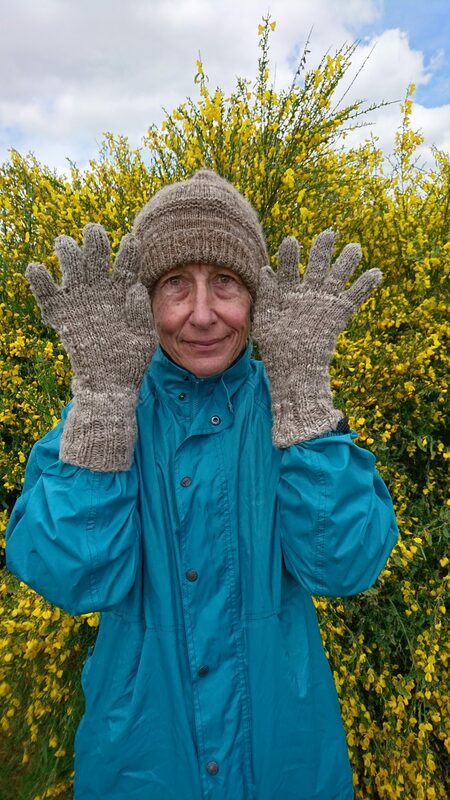 Nancy was taking a trip home to the UK and asked for some greasy wool gloves as her hands get very cold. Bev S did the spinning and Beth did the knitting for these amazingly warm, thick gloves. 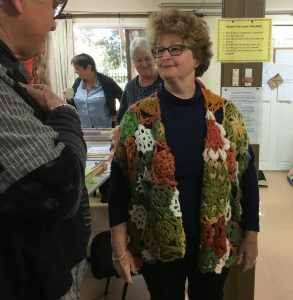 Here is Nancy wearing them on her trip and she looks very snug. 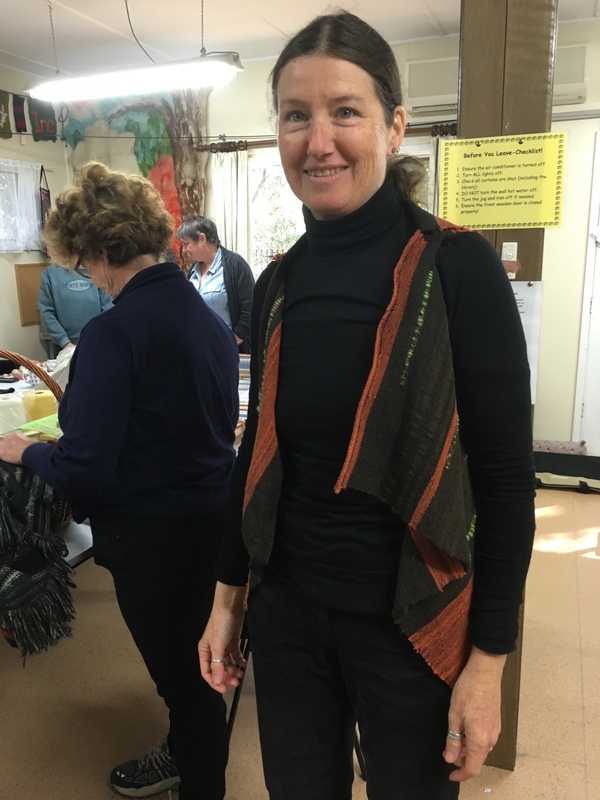 Lyn, Gay and Trudie attended the Central Coast Grammar School Spring Fair this year. They had a lovely spot in the sun, although the day was pretty quiet for us. 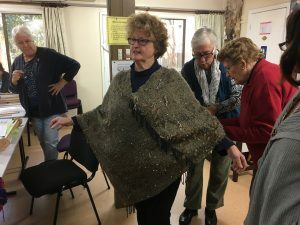 The ladies still had a nice day together.